Vol. 53, No. 12(2008) p. 1103–1110,. Vol 58, No. 4 (2012), p 547-556. 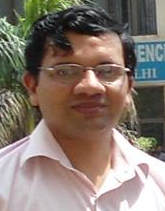 Workshop on Euclidean Harmonic Analysis (From 11-12-2006 to 24-12-2006 at IIT Kanpur). National Symposium on Functional Analysis, Optimization And Their Applications, Jan 19-20, 2007 at Deen Dayal Upadhayay College, University of Delhi. National Workshop on Analysis, Sep 27-28, 2007 at Department of Mathematics, University of Delhi. Department of Mathematics, University of Delhi. 10th Discussion Meeting in Harmonic Analysis, IISc Banglore(2008). Pre ICM ICMS, 2008, Department of Mathematics, University of Delhi. National Meet on History of Mathematics, 2009, Department of Mathematics, University of Delhi. National Initiative in Mathematics Education: Northern Region Conference(2011). 12th Discussion Meeting in Harmonic Analysis, ISI Calcutta(2011). International Workshop on “Geometric and Analytic Aspects of Hyperbolic Spaces” during December 10-15, 2014, Department of Mathematics, DU. International Workshop on Operator Spaces during December 7-9, 2015, Department of Mathematics, DU. 14th Discussion Meeting in Harmonic Analysis, December 10-12, 2015, Department of Mathematics, DU. Delivered contributed talk in “International Conference on Operator Theory and Related Areas, 2008” on “Polyharmonic Dirichlet Problem on the Heisenberg Group” at University of Delhi. Delivered contributed talk in “Pre ICM International Convention in Mathematics and Mathematical Sciences, 2008” on “Green’s Functions on the Heisenberg Group” at the department of Mathematics, University of Delhi. Delivered a talk in “Advances in Mathematics: Focus on women in Mathematics, Oct 2009’’ on “Potential Theory on the Heisenberg Group”. Delivered a talk in the Symposium on Analysis in the Annual Conference of the Ramanujan Mathematical Society at NIT Jalandhar(2010) on “Dirichlet Problem on the Heisenberg Group”. Delivered a talk entitled “Green Function for the Annular Domain in the Heisenberg Group” in the 13th Discussion Meeting in Harmonic Analysis (2013). Delivered a talk entitled “Am I Prime?” at the Indraprastha College of Women, University of Delhi (2014).